Aliya S. King on why Blue Ivy isn't the real hair police target. When Jasmine Toliver created her now infamous change.org petition to get Beyoncé to “understand the importance of hair care” and “properly care for Blue Ivy’s hair,” it hit me in the solar plexus. I knew it was a joke. (Ha-ha, let’s criticize a two-year old!) But I couldn’t find the humor in it at all. 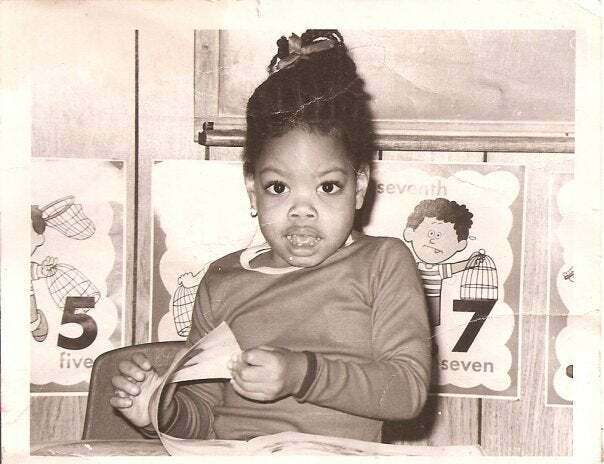 Because in the ‘70s and ‘80s, I was Blue Ivy. Here’s the thing. My mom was not the one when it came to hairstyling. And so, for as long as I can remember, my hair was never done. I mean, like, never. Okay. Not never. But in terms of what’s considered acceptable in the Black community? Never is the right word. My mother tells me that by the time I was two years old I was sprinting around the house and hurdling over furniture whenever she tried to come near me with a comb. So she gave up. In the morning, she’d smooth my hair back, put it in a ponytail and send me on my way. My mom was the master of smoothing. There was very little actual combing of the underbrush. In many of my childhood photos, what looks like a cute little bun is actually a bird’s nest with a top layer of smoothing. Once, my 3rd grade teacher actually called me up to her desk and spent thirty minutes doing my hair in front of the whole class. (She had a comb and that green jar of hair grease in her desk!) While I winced in pain, she mumbled about how it made no sense for me to come to school every day with my hair looking a mess. When my mom picked me up she noticed my hair and I told her my teacher did it. I could tell she was embarrassed. I was too. As an adult, I playfully chided my mom about her hairstyling skills, or lack thereof. She would always shrug and say, “If you ever have a little girl who is anything like you were, you’ll know what I went through.” Fast forward to 2007. I give birth to a little girl. I wasn’t completely unprepared for the hair journey since I already had a ten year-old stepdaughter whose hair I’d been styling since she was 5. But my older daughter wasn’t the type to run away from a comb. She liked having her hair neat and was (somewhat) willing to deal with the inconvenience. But the kid I gave birth to? When she started sprouting serious hair around age three, it was a wrap. Like me, she was what the old-folks called “tenderheaded.” I would have to walk up to her with a comb behind my back the way the dentist does with a needle. If she saw the weapons of mass destruction, she was gone, screaming for Daddy to save her. And so, like my mom thirty years before, I gave up. And now I have my very own Blue Ivy. Except I have the real version of what Blue Ivy’s critics say is wrong with her hair. Toliver’s petition (and many of Beyoncé’s critics), mention the “lack of hair moisture” in Blue’s hair and that she was developing “matted dreads and lint balls.” I’ve never seen Blue Ivy’s hair matted and with lint balls. Never. Have I seen her hair unraveled? Sure. Have I seen her hair out and free and not beaten into submission with a paycheck’s worth of over-priced natural hair products? Absolutely. I know what neglected hair looks like. I see it every morning when my kid wakes up. Blue Ivy’s hair is not always perfectly coiffed. But that is not neglect. What was said in jest in that petition is real life up in my house. Lint balls? Matted dreads? Yeah. I’ve had moments where I had to take twenty minutes to undo a single linty twist in my daughter’s hair that was one day away from becoming an official dreadlock. One of the moms in my daughter’s class told me that when it’s her day to volunteer, the first thing she does is check my daughter’s hair for lint balls. She said it jokingly and I know she meant no harm. But all I could think about was my third grade teacher, feeling like she needed to pick up my mom’s slack. It’s actually an inside joke in my entire family. At parties and gatherings, there are playful snickers if my daughter’s got a smooth nest going on. And someone’s always side-eying me and asking me how the hair-styling journey is going. Now, I’ve had my moments. Sometimes I’m on it. All-day process of washing and twisting? Check! Moisturize ends at night and sleep in satin cap? On it! But it never lasts. I can’t keep up. I send her to the salon when I can and let them handle it but with schedules and costs, even that’s not always consistent. Jasmine Toliver picked the wrong child to create a petition over. Blue Ivy’s hair is perfectly fine. If she’s really concerned about children and hair care, she needs to find the right target. Hey Jasmine, create a petition about my daughter. It will have more than two thousand signatures in no time at all. And maybe the shame and embarrassment you wanted Beyoncé (and Blue Ivy) to feel will hit me instead and I can feel worse than I already do about something as unimportant as the dead matter that sprouts out of my baby girl’s head.